THE LATEST VIDS: NGAWANG AND SANJAY! Ghost Story Telling with Nerupa and Isabel! So as you may know, during Dare Nite: Lockdown there will be ghost stories performed by The Torontonians and an especially eerie true story about the Gladstone Hotel itself. While me and Isabel were rehearsing our stories in the office, a Gladstone rep popped in and told us that a group of kids just stopped by to take shelter in the ballroom from the thundering rain outside. She invited us to go downstairs and give them more information about our event as they were awing our poster while entering the building. Annie gave us the idea to test out our story telling skills to the kids and give them a demo of Dare Nite: Lockdown. Down in the ballroom we shut all the curtains tightly and turned off all the lights. However, we did keep a flashlight below our chins to creep the kids out as we told our stories. The ambience of the whole room was almost chilling. You could faintly hear the rain hit the windows in the background, plus the air conditioning just happened to vamp up the atmosphere even more. I personally thought me and Isabel did a fantastic job at scaring the children! Most of them tucked their knees below their chins and listened intently with wide eyes. After we were done, a couple of children from the group shared their stories, and even their councillor told a true story she experienced herself. It was a great feeling to hear others share their stories, and even be a little scared myself. If you'd like to hear our stories you gotta come over to Dare Nite: Lockdown! Who knows, they might just come to life during the night..
NEW PROMO VIDS WITH KIAM AND NERUPA!!! Nerupa & Isabel Hunt For Ghost Stories! Hi, Nerupa and Isabel here coming at you with another video! 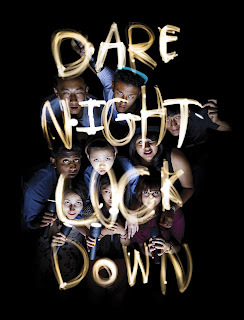 One of the activities during Dare Nite: Lockdown includes a scary story session held in the dark. In the Ballroom. In the Gladstone Hotel. There will be stories performed by yours truly, The Torontonians! Stay up and listen to a ghost story about the Gladstone Hotel itself. We encourage YOU to share your own stories to! Chosang's Promo Vid: OUT NOW! !